Cape Cod style garages add beauty and property value to your home. They include one 36” entry door, two 24” x 36” windows, and one 8′ x 7′ insulated steel garage door. 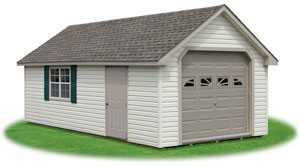 Our portable garages are great for use as an everyday garage for your car or pick-up truck. motorcycles, lawn equipment, or other recreational equipment. They also work great as a workshop or a place to work on that antique car restoration project.